Couple of months ago1 I started to use Emacs as my secondary email client; the primary one remains Gmail's web interface. Bringing my Gmail account to Emacs wasn't as smooth sail as I hoped it to be, but I'm happy with the results so far. Why use Emacs for emails? And, because these images makes emails look way cooler in Emacs than in any other client. I went back and forth between mu4e and gnus, and finally took Dhavan Vaidya's advice to pick one and just move on with it. Unlike him, though, I chose mu4e, mainly because its focus on search. So here we go - implementing mu4e in Emacs. For a quick and dirty checklist, follow the first part, which summaries the steps to get mu4e working. If you're more of an FPS person, and interested in the details, read through the second part, which journals my steps as well as the errors I encountered and their fixes. Note: The Mu4e official manual is great, as long as everything works flawlessly. In my case, though, I run through every problem and error possible. So if you want to install mu4e, I recommend you'll start with the manual. If you get stuck, or encounter a problem, you might find the solution here. Configure offlineimap to point to the IMAP server you would like to connect to. Run offlineimap for the first time to download your IMAP folder from the remote server. Run mu to index and load the messages into Emacs. Configure your Emacs init file to connect with mu4e and customize the client. According to the manual, mu4e is only a client, or an interface to my emails, and does non of the fetching, storing, editing or sending them on its own. This leaves mu4e to concentrate on what it does best: quickly finding the mails you are looking for, and handle them as efficiently as possible. Mu4e should, therefore, be complemented with the other components to work. My hope is that installing all those packages won't be too big of a hassle... And with that, let's move on to the installation checklist. This sslcacertfile line I got from stack-overflow, after getting an error when trying to load offlineimap. Download the ca-cert bundle from sourceforge. I didn't have to, but if it still doesn't work, try running /usr/local/opt/openssl/bin/c_rehas , so openssl can take note of the new certificate. Offlineimap is finally working, and downloading my emails. Waiting... I have 45977 messages to sync, so it's going to take some time. I'll do other stuff in the meantime. Running offlineimap again. Works this time. While my repository is syncing, I switch to configure mu and mu4e. Once the offlineimap process ends, I run mu to index my emails, which located at the /Maildir folder, as defined in the ~/.offlineimaprc file. And now, finally, when I run M-x mu4e, Hooray! 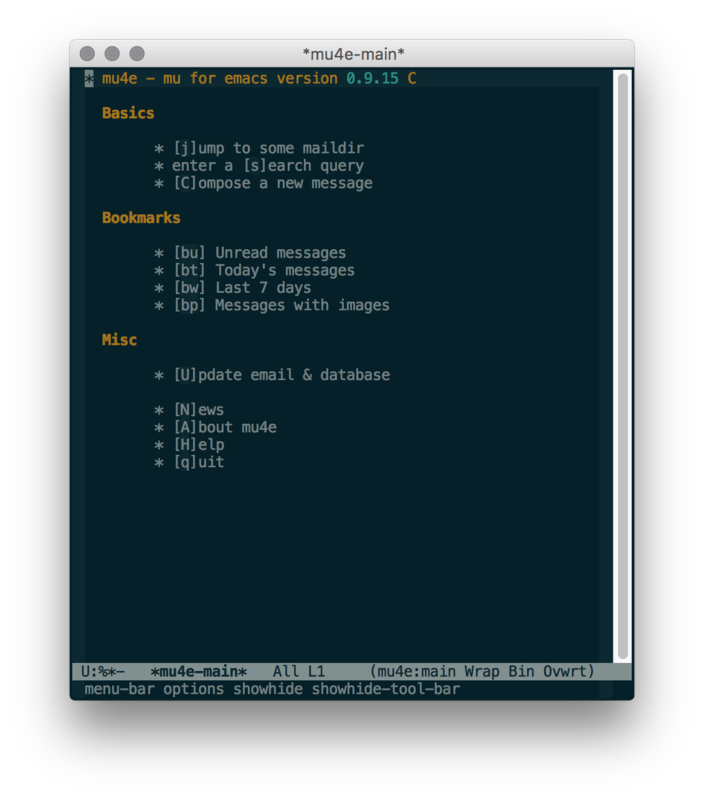 Now that I have all my emails in Emacs, I'll start learning the ins-and-outs of mu4e, and customize it further. I spent days trying to sort this problem out. I went through Google's detailed checklist numerous times, read and posted in Google's support forum, looked in stack-overflow, but found nothing to help me solve that error. Finally, I found an EmacWiki's article about sending mail in Emacs. It mentions the $(HOME)/.authinfo file and I suspected it had something to do with the problem I had... I opened this file, and lo and behold... it had my Gmail credentials, including my old password in it. I updated the password and now I can use mu4e to send emails again.